Vulcanic strip heaters are designed for the heating of flat metallic parts (tools, plates, moulds, etc.) and for the indirect heating of fluids through a wall (tanks, containers, etc.) up to 600°C, 400 V 1-ph. Vulcanic offers two different technologies in order to meet all customer needs and applications. 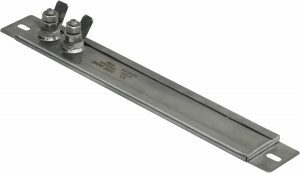 Sheathed mica strip heaters are comprised of a resistive strip insulated between two mica plates. This assembly is protected by a coated or stainless steel sheet. With a maximum operating temperature of 300°C, these thin strip heaters (max. 4 mm) are rectangular or circular as standard. They are connected to the power supply by threaded terminals or cables. Vulcanic also offers strip heaters of different shapes (trapezoid, octagonal, etc.) with drilled holes or notches, or with non-homogenous power distribution. Ceramic insulated strip heaters are composed of a resistive wire inserted into ceramic insulators. This assembly is protected by a stainless steel or Inconel sheet. With a maximum operating temperature of 600°C, these ceramic strip heaters are rectangular or circular. 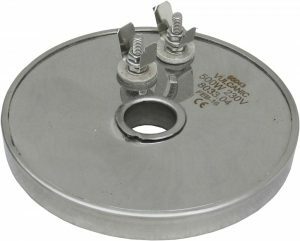 They are connected to the power supply by threaded terminals or nickel leads under ceramic beads. As an option, they can be equipped with fixing clamps in order to hold the heater on the part to be heated. 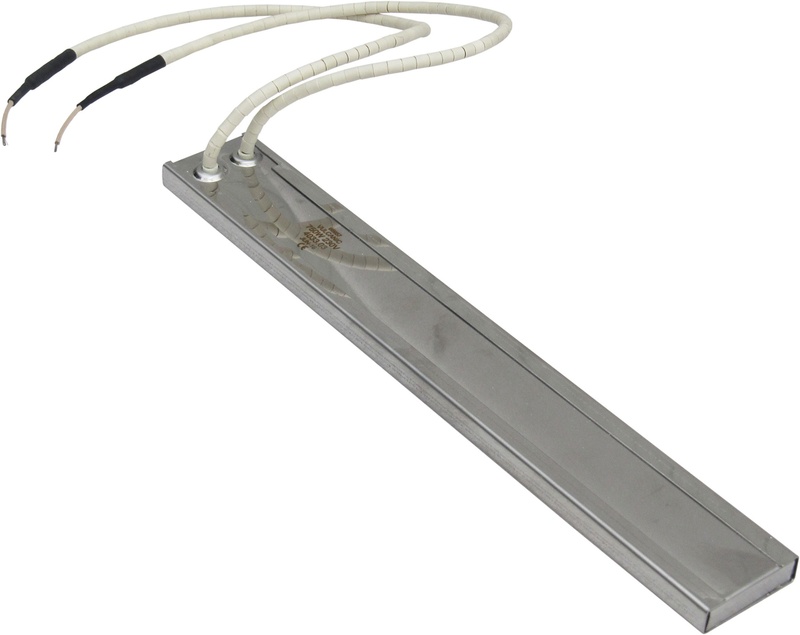 Vulcanic strip heaters are designed and manufactured either as part of our standard range or as a customised solution (power, dimensions, voltage, etc. ).